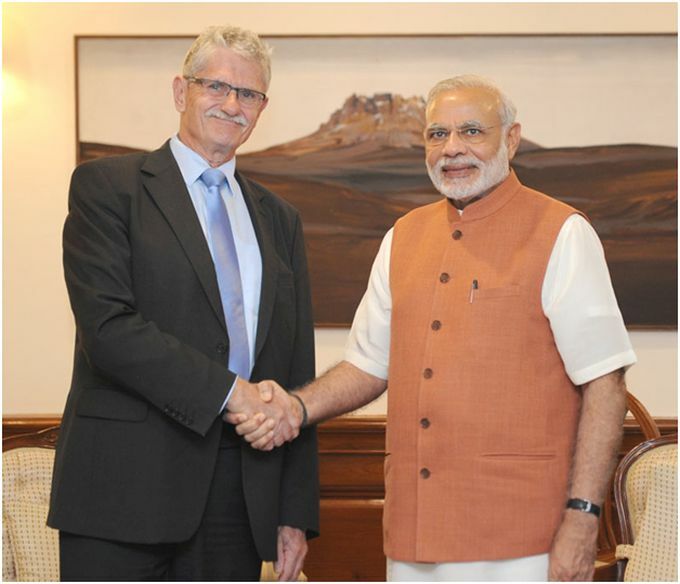 New Delhi (IAIJ):Prime Minister Mr. Narendra Modi received Mr. Mogens Lykketoft, President-elect of the 70th Session of the United Nations General Assembly on August 31. Prime Minister congratulated Mr. Lykketoft on his election as the President of the landmark 70th Session of the UN General Assembly which would begin with the UN Summit for the adoption of the 2030 Agenda for Sustainable Development. Prime Minister said that he was looking forward to participating in the Summit on 25 September 2015. He noted that many of the Sustainable Development Goals, which form the core of the 2030 Agenda for Sustainable Development, were already being implemented through flagship programmes of Government of India, such as Swachh Bharat Abhiyaan, Make in India, Digital India, Skill India, Smart Cities and Jan Dhan Yojna. Prime Minister emphasized that the 70th Session of the UNGA was a crucial moment for the UN. It would be important to ensure that the UN meets the high expectations of the people. In this regard, Prime Minister called for securing concrete outcome on the long-pending issue of reform of the UN Security Council, and strengthening the legal framework to combat terrorism through early finalization of the Comprehensive Convention on International Terrorism. Mr. Lykketoft briefed Prime Minister on his priorities for the 70th Session of the UN General Assembly. In this regard, he specifically mentioned his priorities as renewing global partnerships for implementation of SDGs, climate change issues, improving the effectiveness of the UN contributions to international peace and security, and improved response to humanitarian situations. Mr. Lykketoft acknowledged that India, as one of the largest democracies in the world, and one of the biggest contributor to the UN Peacekeeping Operations should have greater role in the decision making bodies at the UN. Prime Minister reiterated India’s commitment to continue supporting the UN peacekeeping operations. Both exchanged views on the issues related to Climate Change and, in this context, expressed hope that the COP-21 Conference in Paris would come up with productive outcome to the satisfaction of the developing countries.